Love Velo are excited to be hosting a women-only cycling holiday. We want to encourage women of all abilities to jump on their bike because, in our opinion, there is no greater way to meet new people and explore a country than on two wheels. With the help and guidance of Rebecca, we're excited to get cycling newcomers riding around the haven of Mallorca. Rebecca Charlton will be on hand throughout the holiday to give cycling advice and tips. Ask questions and get to know Rebecca all whilst relaxing in your luxury hotel and cycling in the Mallorcan sun. Following years of racing experience, presenting and working in the cycling industry, there is no one better to talk to about how you can also get the most out of your time on the bike. Mallorca is the home of cycling which means it is the best place for those heading on their first cycling holiday. The roads are smooth and there will be the option of flat rides as well as the slightly more undulating, allowing you to grow more confident on the bike. At the end of each cycling day, take advantage of your hotel's spa and wellness facilities before enjoying dinner with the whole group. Upon arrival at Palma airport, you will be picked up and transferred to your hotel in Port Pollensa in the north of the island. Once everyone has arrived, take some time to settle in before getting to know the rest of the group and your host for the weekend, Rebecca. Rest up in the hotel this evening, enjoy a meal with the group and start looking forward to an exciting day of cycling and relaxation tomorrow. Following a relaxed buffet breakfast in the morning, pick up your bikes and head south with your two local guides into the rolling Mallorcan countryside. This is the perfect cycling playground for riders on their first cycling holiday. A key feature of this holiday is that the group rides will be fully inclusive to everyone’s ability. As such, the morning ride will be ridden at a steady pace ensuring no one gets dropped or rides ahead. Those who want to ride more/at a faster pace will have the opportunity to do this tomorrow. Your local guides know the area better than anyone so will tailor the best ride for the group. Following some lunch, jump back on the bike and enjoy a gentle ride back to your hotel in the afternoon. You will then have time to relax and make use of the hotel’s spa facilities. With indoor and outdoor pools, sauna’s, gyms and massages available, enjoy the ultimate relaxation experience this afternoon, a fine reward after a successful day on the bike. Rebecca will, once again, be on hand around the hotel so don’t be afraid to have a chat and get to know her some more! Rejoin with the group for dinner and maybe a drink or two in the bar before resting up for another day on the bike tomorrow. Today will be slightly different to the first day on the bike with two rides to choose from. One of our favourite rides on the island is to Cap Formentor, the northernmost point in Mallorca and one of the most stunning 50km rides in Europe. Rebecca and your guides will be leading a ride to the tip of the island this morning for whoever wishes to join them. 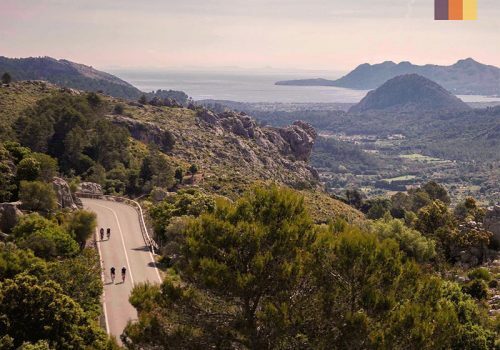 Anyone who doesn’t feel up for the long ride in the morning can join in with Rebecca’s shorter afternoon ride along the north coast towards and beyond Alcudia. This will leave once the morning ride has returned and everyone has eaten and rested. Take part in one or both of the rides depending on how you’re feeling after the first day. If you choose not to attend, make use of the hotel’s facilities or head into Port Pollensa or Alcudia and explore the popular towns. Relax on the beach or grab some food in one of the many restaurants on the coast. Have a chat to our cycling experience team for some recommendations and things to do in the area. This evening will be your final group meal. Spend some time recapping the day and catching up with the rest of the group. Head to the bar for a farewell drink and start planning your next cycling adventures after catching the travelling bug! Today you will be taken back to Palma airport after a busy and successful weekend of riding. If you would like to extend your trip, just let our team know and we can arrange for bike hire and hotels for another day. Say your final farewells to the team and Rebecca before heading in your different directions home. Spring in March, April and May offers the best riding. The island is taken over by cyclists and you're likely to see more bikes than cars. This is our favourite time to cycle in Mallorca. The north of Mallorca is one of the most popular European cycling destinations. You will stay between port Pollensa and Alcudia, providing access to Cap Formentor, flatlands, and coastal rides. Overlook the sparkling Mediterranean and relax on the sunshine coast. There’s something for everyone on the sunny Balearic island which is why Mallorca is such a popular destination amongst road cyclists. With Rebecca on hand throughout the weekend to provide advice and cycling tips, you will return a more confident rider, ready to start planning your next cycling challenge. Your stay will be in a luxury 4* Hotel and Spa which sits in the north coast of the island in Port Pollensa. This will be on a half-board basis and is perfectly located for access to the islands great rides. There is also access to excellent on-site facilities including sauna's, fitness zones, jacuzzi's, massage rooms and more. You will be met and collected at Palma airport on your arrival and be provided with a transfer back to the airport on your final day. Your stay will be on a half board basis. This ensures the whole group can stay together for an end-of-the-day meal. Recap the day on the bike and take the time to really get to know your host. We recommend exploring the local towns for lunch as there are some excellent places to eat on the coast. Alternatively, prepare lunch and enjoy it whilst on your ride. This package includes 2 full days of road bike hire. We always suggest hiring bikes in Mallorca as this saves the hassle of bringing your own. Prior to the trip, we will ask you for your height and pedal fittings. This will ensure the bikes are set up and tailored to you when you arrive. Our essential bike in Mallorca is a full carbon road bike with Ultegra groupset but we can upgrade or provide hybrid, mountain and e-bikes if you prefer. Your holiday will be led by two local, English speaking guides. We use excellent guides in Mallorca who know the area better than anyone. The rides will be tailored to the group's ability, allowing Rebecca to ride up and down, getting to know everyone whilst on the bike. You will want to know that your bike is in great condition and that you won’t have any mechanical problems during your ride. Our bikes are extremely well serviced and maintained but in the very unlikely event that there is a mechanical issue with the bike (not including basic maintenance such as slipped chains or punctures), there will be a support vehicle on hand to assist you.